Coworking Space vs. Business Centre Office: Which is Better? There is a common misconception that coworking space is the same as business centre office space, but is cheaper with more opportunities for networking and collaboration. These are the claims made by coworking providers, however, often these are misleading claims using an apples-to-oranges product comparison – and assume business centres don’t have networking and collaboration because they don’t mention the obvious in their advertising and presentations. If you’re an entrepreneur in the early, pre-seed stages of founding a startup, you’ll want to check into the Startup Boost 6-week pre-accelerator program to be held this spring in Toronto, New York, Los Angeles and London. The objective of the program is to prepare pre-seed stage startups around the world for accelerators, investment and revenue creation. a worldwide network dedicated to helping entrepreneurs succeed. Applications for the Spring 2018 program are open until March 26th and can be found online (Global programs). It goes without saying, providing exceptional customer service is key to running a successful business, whether you offer products or services. Central to that is the ability to provide prompt, professional answers to your customers’ questions and resolve any problems in the same manner. You’re likely aware that outsourced call centre services are a trend, but do you know why? For one, outsourcing is highly cost-effective – saving you approximately 50 percent. (That alone is enough to convince some business owners of the profitability of using a call centre). Then there’s the increased productivity when you and your employees can focus on the business’ core operations uninterrupted. Also, you can be assured of the professionalism of an outsourced call centre. The main drawback is less control over this area of your business. In the end, you’ll have to determine for yourself whether an in-house or outsourced call centre is best for your business. The federal, Ontario and Quebec governments announced that they are partnering with five of the world’s leading tech companies in funding research into next-generation 5G wireless technology. The project is called ENCQOR – Evolution of Networked Services through a Corridor in Quebec and Ontario for Research and Innovation – or simply, the “5G Corridor.” The concept is to establish a network of linked research facilities that will be used not only by the five tech partners will to test products and services that run on 5G networks, but also by an estimated 1,000 SMBs across Canada for their own research and development. Entrepreneurs who want to go into business for themselves, but not necessarily by themselves, may want to consider a franchise opportunity. Besides having an established product or service, franchisees have access to the franchise’s tools and resources and more avenues for securing funding. Being willing to get involved in their local community and to have a boss, as well as the foresight to select the right franchise for their area, are keys to a franchisees’ success. 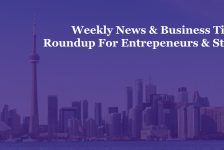 Mark your calendar: the Canada-based online funding program Fundica will be holding its annual coast-to-coast roadshow in Toronto on June 28th at the MaRS Discovery District. Fundica is seeking startups with a technological component to their business to qualify for its prized Investment Award. To be eligible, your company must be in the seed or growth stage, incorporated in Canada and have an expected revenue growth greater than 50 percent.